Cook bacon at 350°F for 15 minutes; brush with maple syrup and continue cooking until crispy (about 5 minutes). Drain on paper towel and set aside. Brush beef patties lightly with olive oil and season to taste with salt and pepper. Grill 7 to 9 minutes on each side, or until desired doneness is achieved. Add cheddar cheese during final 2 minutes of cooking. Meanwhile, brown butter in a small skillet. Add mushrooms and sauté for 3 minutes; set aside. Toast rolls on grill and spread both halves with balsamic aioli mayonnaise. 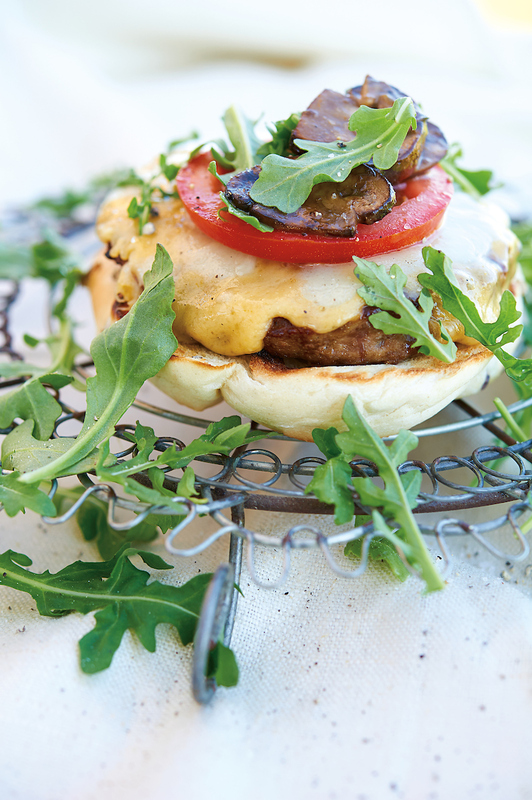 Place patties on bottom halves of buns; layer with bacon, mushrooms, tomato and arugula. Top with remaining halves of rolls. BALSAMIC AIOLI MAYONNAISE: Place 2 or 3 cloves peeled and chopped fresh garlic and ¼ teaspoon sea salt in a blender, or in a food processor fitted with a metal blade. Pulse for two seconds. Add 1 egg yolk (at room temperature), juice of ½ lemon and 2 teaspoons balsamic vinegar; pulse on and off until blended. Turn on blender at low speed and begin adding 1 cup olive oil in a thin stream. If the mixture becomes too thick, thin with a small amount of room-temperature water and continue adding oil until fully incorporated. Finish with salt and pepper to taste. Makes about 1¼ cups.